I've actually focused some of my time and energy into crafting over the past several days. Hopefully, this explains my lack of posting. I've kinda jumped around from one medium to another, but all projects have been jewelry-based. 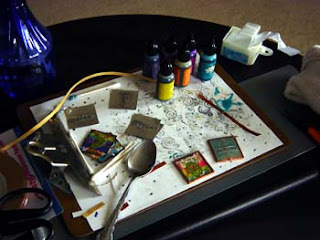 On Saturday, I made a shrink plastic pendant involving my odd doodling style and some colored pencils. On Sunday, I spent the morning meditating with my beads and was able to produce a necklace and some earrings for my mom's birthday. They include some polymer clay mokume gane beads that were made with her in mind a few months back. I hope she likes it. Her birthday is Friday. I was also able to pick back up a fall-themed free form peyote necklace and decided that it is screaming to be a bracelet instead. It is one of those MANY half-completed items on my craft table. It's still not done because after lunch and some shopping, I felt the need to solder. But first, I needed to create something to frame with the solder. Therefore, I began playing with a variety of scrapbooking papers and decorative edged scissors before leaving the house to have dinner with friends. After dinner, I did some decorating of the paper with foil tape, stencils, and stamp pads. Just before bed, I cut the page into pieces that would fit under the 1 1/2 inch slides. While at work on Monday, I doodled onto and colored more shrink plastic. When I got home, I got to cut and shrink it!! 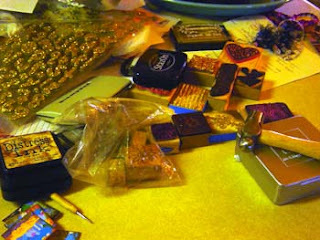 Then, I started back on the decorated paper squares for soldering. I stamped, distressed, and stuck glitter letter stickers on them before heading to bed. I probably won't get to craft tonight since I will be helping my mom out with my nieces (as I try to do once a week or so as time and schedules permit.) But, I may try to take some shrink plastic over to her house just in case. I'm a crafty maniac! I need help, I need to clean up. Nah! I need to finish these projects first. I'll try to post pictures of the actual projects soon. Hey Twylitehope. Thanks for visiting my blog. I see that you enjoy crafting as much as I do. 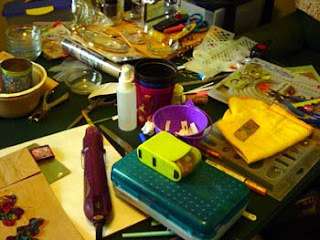 Well I am hosting a craft club onmy blog. You can find the link under topic "Blogger Craft Club" on my sidebar. I would love for you to show picture of your work. All you have to do is add your name and post URL to Mr. Linky and myself and the other participating crafters will come and check out your projects. If you want to no moer just follow the "Blogger Craft Club" links on my page.